Professional with over 20 years' experience in quality control/ quality assurance in aerospace technology in both manufacturing and in-service of aircraft and aircraft components. additional experience in customer service, vendor coordination, and cost control for all parties, with an emphasis on quality. Developed a highly acclaimed reputation for leadership in the field of aerospace NDT and recognized with numerous certificates and awards. Recognized for long hours, commitment to customers, attention to detail, professionalism, and following up on projects. Developed an excellent rapport with numerous third-party vendors, which allows for smooth coordination of outside services. Served as liaison between engineering, production and service departments to ensure compliance with procedures by providing timely, accurate information to all parties. NDT Technician Oct 2011 －Present Timco Aviation Services Lake City, FL Perform NDT on customer's Airbus A-320 aircraft. * Certified Level III in RT and MT. * Certified Level II in UT, ET, and PT. * ASNT IRRSP certification in X-Ray only, and FAA Certified Repairman. Ultrasonic Technician Aug 2011 －Apr 2012 Parkway Products Erlanger, KY Developed an Ultrasonic inspection program for in-house testing of aerospace components - both metal and composite. * Developed a written practice for qualification and certification of NDT technicians in accordance with NAS 410. * Developed a procedure for contact inspection of composite bonded joints for the ERJ 170/190 program. * Worked with customer and vendor to develop a procedure for immersion inspection of turbine engine components. Instructor Mar 2010 －Aug 2011 Spartan College of Aeronautics Tulsa, OK Instructed students in all NDT courses, Radiation Safety, and Codes and Standards. * Added new material to curriculum. * Member of the Advisory Committee. * Member of the Capstone project Committee for graduating seniors of the Bachelor Degree program. 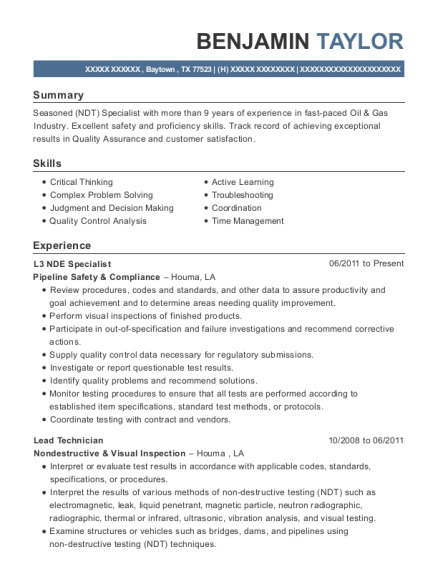 Sr. NDT Technician Jan 2007 －May 2009 Gulfstream Aerospace Corp. Savannah, GA Performed NDT on both production and in-service aircraft and components. * Certified Level II in MT, PT, RT, UT, and ET. * Experience with both metal and composites. * Involved in Lean/Six sigma Program by performing internal audits. Lead NDT Technician Apr 2005 －Dec 2006 Duncan Aviation Battle Creek, MI Managed the NDT lab that provided support for all departments. * Certified Level II in PT, PT, UT, and ET, and FAA Certified Repairman. * Prioritized work schedules to meet all customers' needs in a timely manner. * By using 'Best Practices,' was able to give customers the best, most efficient service. Consultant / Contractor Jun 2001 －Apr 2005 Self Employed Cincinnati, OH Provided services to customers by starting up NDT labs at various small machine and fabrication shops. * Certified Level III in PT and MT. Certified level II in RT and ASNT IRRSP certified in X-Ray only. * Wrote written practices, training programs and procedures for customers, as well as trained and certified their employees. * Determined what equipment and supplies were best suited to meet clients' current and future needs. 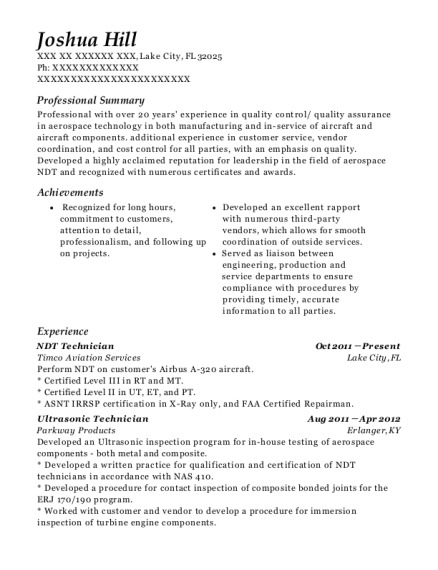 This is a resume for a NDT Technician in Lake City, Florida with experience working for such companies as Timco Aviation Services and Parkway Products. 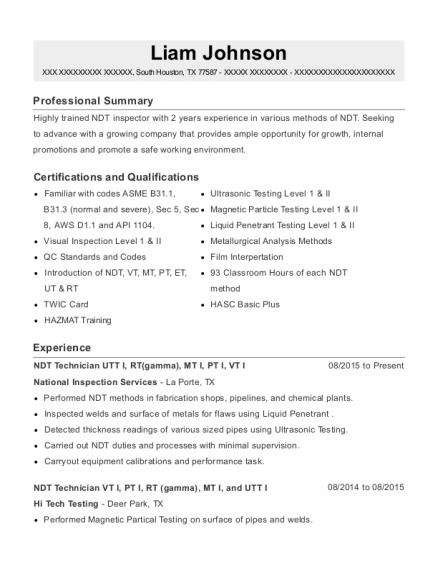 The grade for this resume is 0 and is one of hundreds of NDT Technician resumes available on our site for free. 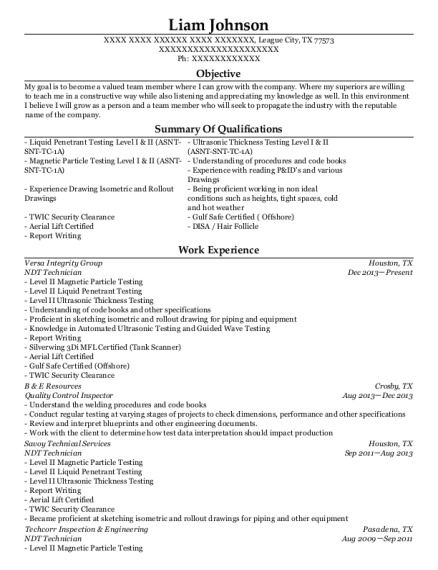 Use these resumes as templates to get help creating the best NDT Technician resume.